A fearless company of teenagers investigate the workings of the adolescent brain. Created with cognitive neuroscientist Professor Sarah-Jayne Blakemore and drawing upon the life experiences of the cast, Brainstorm is a thrilling exploration of the most frustrating, chaotic and exhilarating changes that will ever happen to us. The script of Brainstorm is avaiable to buy so that schools, youth-theatre groups and young companies are able to create and perform their very own version of the show, for more information see below. 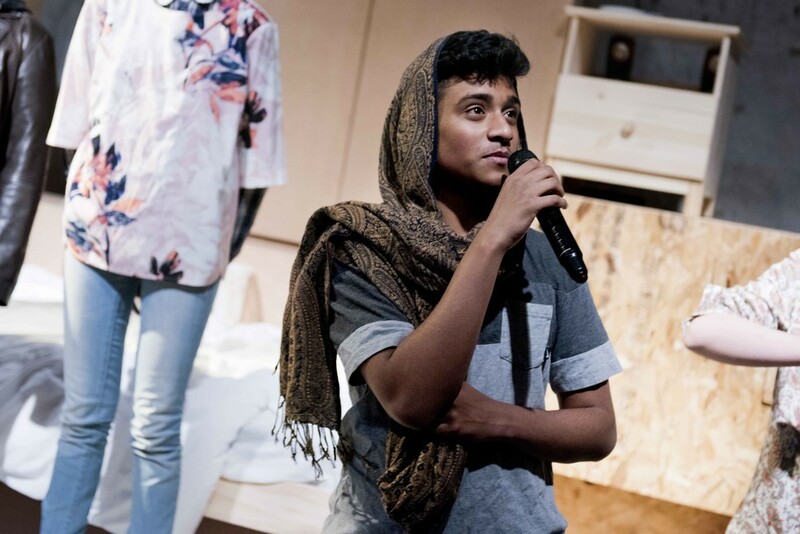 Brainstorm was created and performed by Michael Adewale, Doyin Ajiboye, Sama Aunallah, Yaamin Chowdhury, Jack Hughes, Noah Landoni, Dylan Lubo, Gracia Kayindo, Romeo Mika, Kassius Nelson, Tyrel Phan, Serafina Willow and Segen Yosife. 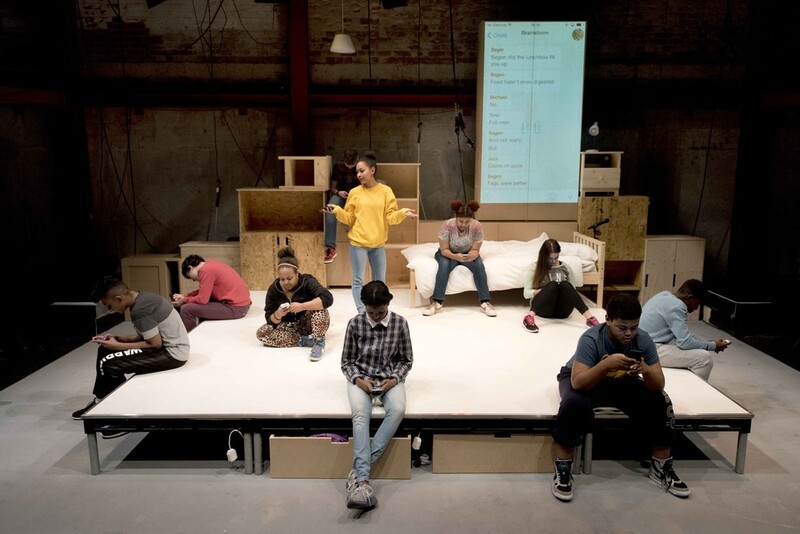 "Putting the play on ... was a profound experience for my students, and we received a number of amazing responses from parents who said it was the most thought-provoking and moving play they’d ever experienced, that it had challenged them to understand and relate to their kids in new ways." To date more than thirty new productions of Brainstorm have been made by other companies including productions in Australia, America, Kenya and Malta. If you're remaking Brainstorm then we'd love to hear from you, do get in touch and say hi. To find out more you can purchase the script of Brainstorm (which includes all the info you need to know about making your own version) at Nick Hern Books. Read teacher/director Steven Slaughter's account of his school's production of Brainstorm on this Nick Hern blog. "This is a very cunningly put together piece, drawing with unflinching honesty on material excavated from the young people’s own lives ... and capturing the hormonal rush and wild mood swings of teenage existence." "A tour of the chaotic limbic system — a rush of risk-taking, caution-free chemicals – gets the audience joining in the truth-telling games with raucous abandon... yet the wires that are really getting crossed are those with worried parents, and it’s the white-hot pain of each bedroom confrontation that brands the heart." "By the end of this beautifully conceived show, we see talent, and passion, and a group of young people trying their best to make sense of the world, while their constantly developing brains hurry to keep up." "The group don't just remind us what it is like to be young — they actively make us want to return to that time. Full of energy and more than a little cheeky humour, their wisdom and self-confidence is impressively beyond their years." A research paper by Robert Blakey at the University of Oxford has shown that watching Brainstorm affected audience attitudes to youth crime. Robert Blakey, the study’s author and a DPhil student at Oxford’s Centre for Criminology, said: ‘We all have this feeling that when we resist an impulse, we are deciding to resist that impulse – not our brain, but this mental sense of me that makes decisions free from biological constraints. But neuroscience suggests this just isn’t true. We are always affected by our brain – in every decision that we make.